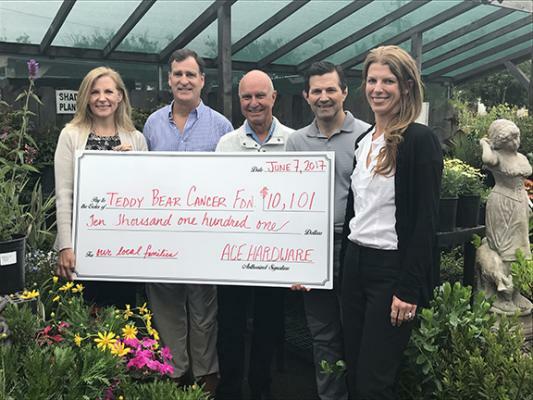 Teddy Bear Cancer Foundation was the fortunate benefiting charity of ACE Hardware’s Round-up Campaign, where $10,101 was raised in just over three weeks by ACE Hardware shoppers to support local kids with cancer. Customers with do-it-yourself goals ranging from gardening to construction were asked to “round-up” their purchase in order to support families of children who have cancer. ACE Hardware employees were passionate about the cause and the success of the Round-Up Campaign was attributed largely in part to their goodwill toward educating costumers about the hardships that families face when their child is battling cancer. Teddy Bear Cancer Foundation’s development associate, Kirsten Stuart, oriented each of the employees about Teddy Bear Cancer Foundation’s mission, specifically who they served and why it’s important to support our local community. She said about working with ACE Hardware, “The employees showed genuine concern for our efforts. Many of them knew families who have been supported by us. They asked thoughtful questions and enthusiastically participated in this fundraising effort. I commend them for making this happen”. Teddy Bear Cancer Foundation is celebrating their 15th year anniversary this year. They are a non-profit organization providing financial, educational and emotional support to families of children with cancer living in Santa Barbara, Ventura, and San Luis Obispo counties. The organization projects they will support a record 165 kids in 2017. Services are provided to families that have a child diagnosed with cancer up to age 18 and continue until they reach 21 years of age. To learn more about how you can get involved with helping children with cancer, or to make a donation, visit www.teddybearcancerfoundation.org or call (805) 962-7466.